Designer style Dark Brown Leather Parka Coats for men, made from soft quality hard wearing Lamb Nappa leather. Straight easy cut body and sleeves, designed to be worn easily over thicker winter clothing. Military style leather epaulettes on shoulders, rever collar with extra detachable ribbed knit inner collar that can be worn as pictured zipped up high in the neck for extra warmth, turned back away from the face or simply zipped out in warmer weather. Two deep full size lower pockets plus two medium size breast pockets all with leather flaps and strong metal stud fastenings. Two full wallet size inner pockets edged with leather (one with a zip). High quality Brown Polyester lining with check design at the top and plain Brown lower down. Soft, lightweight internal Thermal interlining for extra warmth. 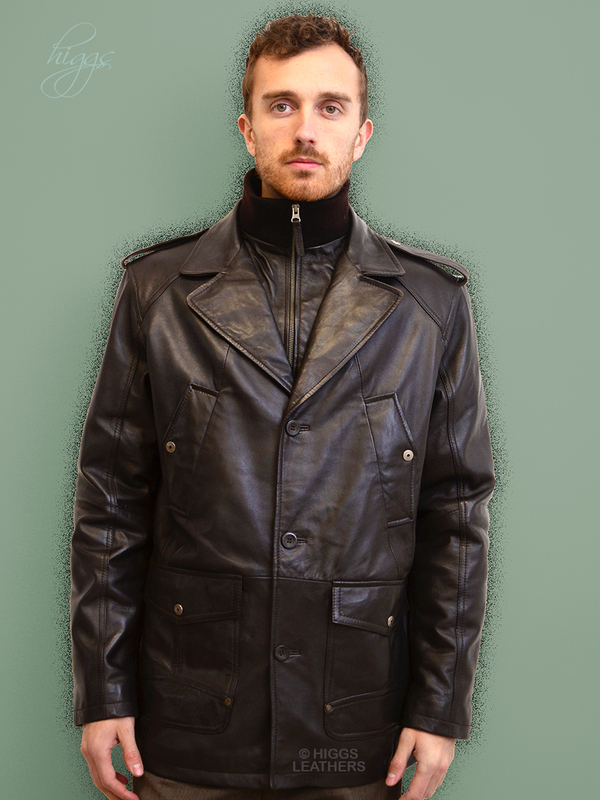 A superbly detailed, high quality longer length men's leather jacket at a very reasonable price! More of our men's Leather Parka coats pictured below. Jacket length approx. 30.5" (77 cm).